Much of the area will experience some fog tonight and early tomorrow morning, as moisture increases from the south. Calm winds and saturation in the lowest 2,000ft should allow fog to develop across central and west Alabama. With a large control burn over Bibb County, smoke from the fire has moved into much of west Alabama. There are also other control burns happening across Tuscaloosa County. 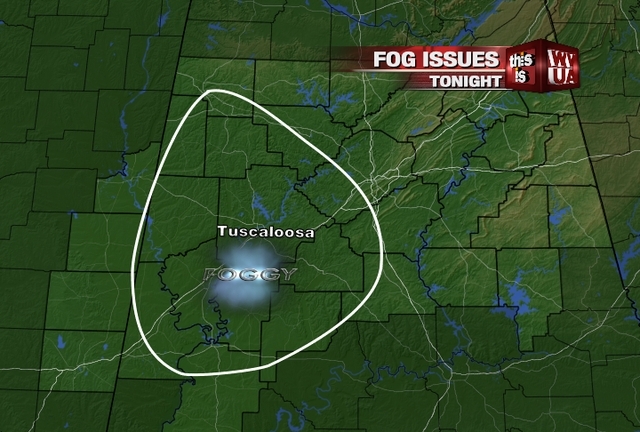 This could cause some additional issues with fog because smoke often enhances the effect or density of fog. If you have to travel late tonight or early tomorrow, allow some extra time incase dense fog is in your area. Good Tuesday afternoon to you! Much of the day has featured cloudy skies, but a break in the clouds this afternoon has helped temperatures warm rapidly. Many locations are in the 70s, under a mostly sunny sky. There are more clouds moving into the area now, and a few showers will become possible later tonight. A warm, moist south flow has developed and is allowing the air to rise across the southeast. Warm and moist air advection is a lifting mechanism, so that has allowed more clouds and showers to develop across the south. Also, a weak shortwave trough will move into the area tomorrow, which will aid in rising motion in the atmosphere. We can expect a few showers tonight, but more organized rain will arrive on Wednesday ahead of a weak cold front and upper air shortwave. Temperatures will remain mild through this week and much of the weekend. With more clouds and some rain on Wednesday, expect temperatures to stay below the 70 degree mark. The weak front and shortwave will pass east of the area on Thursday. 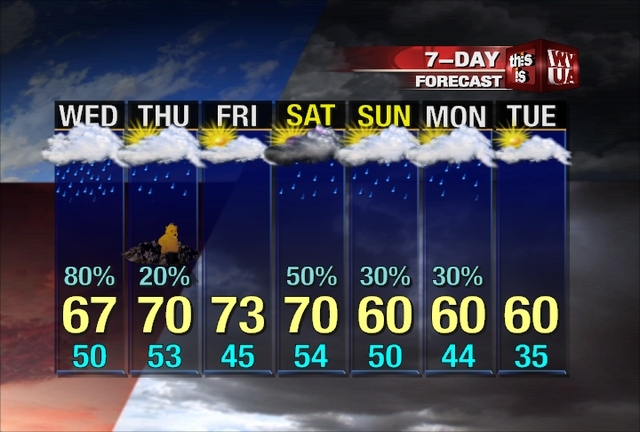 Rain will decrease from west to east late Wednesday night and early Thursday morning. I expect much of the area to stay dry on Thursday, but don’t be shocked if you see a passing shower. Skies will become partly cloudy on Thursday and Friday, and temperatures will warm into the lower 70s. Lows will fall into the middle 40s by Friday morning due to a little drier air slipping in from the north. A gusty south wind will develop Friday afternoon and on Saturday. This will be ahead of a strong storm system west of Alabama. A deep upper air trough will cut off into an upper level low across the Plains. The forecast over the weekend and next week will be a tough one because of the tricky movement of upper level lows. Some data brings the system through on Saturday and Sunday, with cooler and drier air moving into the state on Sunday, Monday and Tuesday. Other data is much slower and keeps the cold front just west of Alabama through Monday before cooler air finally moves in on Tuesday. The more reliable EURO keeps a slower progress, with the heavier rain moving in on Sunday and Monday. This will also mean temperatures will stay mild through Sunday. The GFS is a little faster, with the best chance of rain on Saturday. This model also brings some cooler air into the state on Sunday and Monday. Since the EURO has been more reliable this season, I’m leaning in that direction. Look for a chance of showers and storms at any time over much of the weekend. Rain totals on Saturday, Sunday and Monday could approach 3 inches due to the slow movement of this system. Temperatures will remain mild through Saturday, with highs in the 70s. We’ll fall into the 60s on Sunday and Monday. If you’ve noticed all the smoke in parts of West Alabama this evening, don’t worry. 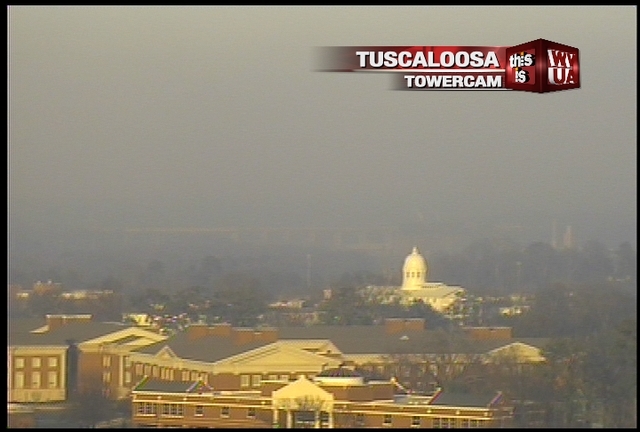 You can see the smoke across the city of Tuscaloosa from our Tuscaloosa towercam. The US Forest Service and Alabama Forestry Commission is burning 1,000 acres in Bibb County! If you have any respiratory issues, you may want to stay indoors through the rest of the day. Our friends to the north are dealing with some very cold weather this week. 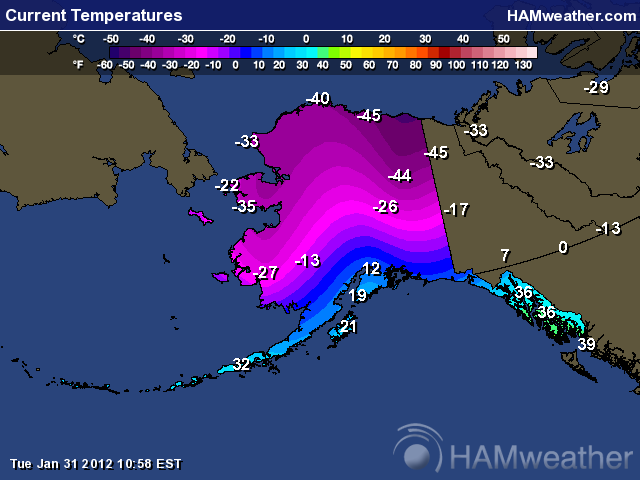 Even for Alaska’s standards, this is extreme. Many places started off in the -50 to -60 degree range this morning, with afternoon highs near -45 to -55 in spots. There’s not much sunlight in Alaska this time of the year, so there’s not much of a change between afternoon highs and overnight lows. The cold air is locked up to the north for now, but if the pattern changes between now and early March, it has a chance to come south. So far, there are no signs of this happening, but we’ll keep a close eye on forecast trends. Winter isn’t over just yet. Meanwhile, temperatures will remain above average through the weekend, with highs in the upper 60s to lower 70s. Skies will remain mostly cloudy today, but most spots will stay dry. Showers will arrive on Wednesday. These pictures were sent to us by Gary Tate over the weekend. This is the Black Warrior near Lock 8 in the Akron area. With all the rain lately, many creeks and rivers have been swollen over the past couple of weeks. There are still river flood warnings in place for the Black Warrior River, but levels are now dropping and will continue over the next few days. The river reached minor flood stage over the weekend, but are falling below flood stage now. Good Monday afternoon to you! I had a great time speaking to the Senior Citizen Group at Stillman College today! I’ll show video of the visit on WVUA-TV news at 5, 6, and 10pm. After a cold start to the day, it’s warmed up nicely this afternoon. Many spots started off in the 20s; in-fact, Tuscaloosa started at 28 degrees. Most locations are well into the 60s this afternoon, under a sunny sky. The deep upper air trough that brought the chilly weather this weekend is progressing east and in a hurry. This will allow warmer air to move in from the west and southwest. Plus, an area of high pressure is shifting east of Alabama. This setup will allow a south wind to transport warm air in from the Gulf of Mexico. We’ll have one more chilly night before lows warm up a bit. Expect temperatures to fall into the upper 30s area-wide. Some of the cooler spots and valleys may reach light frost criteria late tonight. Highs will warm into the lower 70s tomorrow afternoon, which is way above average. Tuscaloosa’s average high is only 57 degrees this time of the year. A fast moving upper air disturbance will bring clouds in from the southwest. Skies will quickly become mostly cloudy on Tuesday, but we should stay dry. 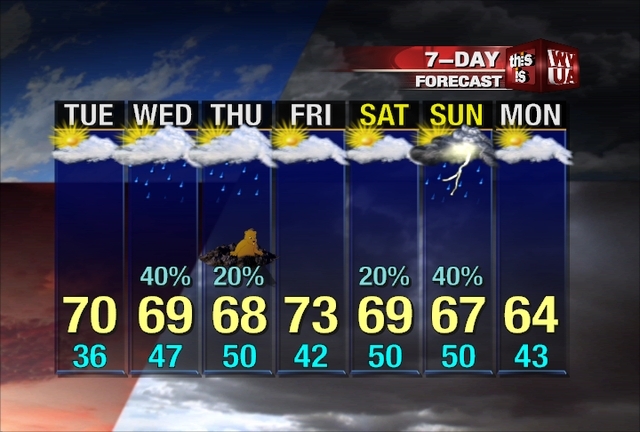 As the disturbance moves over central Alabama on Wednesday, showers will increase. Most data keeps the heavier rain south of HWY 80, but I expect most spots to pick up between a quarter and half an inch between Wednesday morning and Thursday morning. Cool air won’t be found behind this system; in-fact, many spots will warm back into the lower 70s on Friday and Saturday. 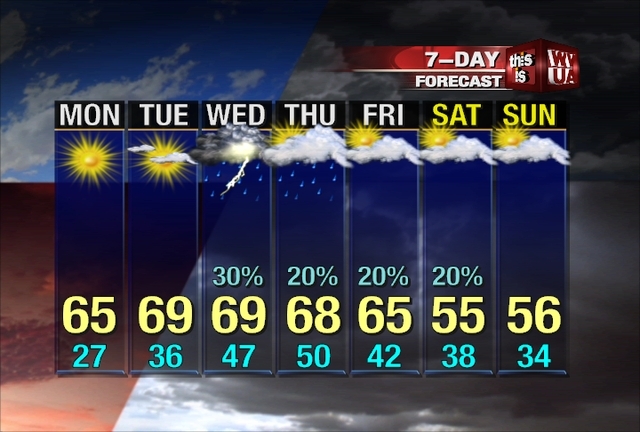 The clouds and a little rain should keep us in the 60s all day on Wednesday and Thursday. Thursday is Groundhog Day. It’s too early to know if the groundhog will see it’s shadow or not. I expect a mostly cloudy sky Thursday morning, so there’s a good chance the shadow won’t be seen. A deep trough will develop and cut off into an upper level low over the weekend. This will occur west of Alabama, which will place all of Alabama under a southwest flow aloft. This means unsettled weather will become likely over the weekend, as upper level energy moves our way. I don’t expect rain all weekend, but you will need the rain gear from time to time. Temperatures will remain mild through Saturday, due to a warming south wind. Highs will remain in the upper 60s to lower 70s through Sunday. Lows at night will remain in the lower 50s over the weekend. Sunday Evening Forecast Discussion – 8:20 p.m.
More dry conditions for the next couple of days with temperatures getting warmer each day. There is high pressure over the Southeast which has brought these dry conditions. It has also allowed our overnight temperatures to drop below freezing the past couple of nights. That will all begin to change Monday evening when the ridge starts to move out of Alabama allowing Gulf moisture to flow into the state. We will also see those clear skies start to fade away Tuesday as more clouds roll into the area. The models still differ a little on what happens next. We anticipate some showers possible Wednesday through Friday, maybe a thunderstorms late Wednesday. A cold front will pass through late Thursday or Friday bringing some cooler temperatures. Long range models are indicating that we could have a brush with some wintry temperatures next week, but we are still a ways out. We’ll talk about all of that as the days go on.